New Athos is a small settlement located on the territory of Abkhazia. He is known for a unique cave ensemble and is a place of attraction for Orthodox pilgrims. here is the famous new Athos monastery, the oldest temple Simenon kanonit, and his cell, not far from the monastery, on the mountain. To get to New Athos, you should cross the Russian-Abkhaz border. In Abkhazia you can get from the nearest airport located in Adler or Sochi, where the Republic of buses, including transit, the final stop which is Sukhum – the capital of Abkhazia. 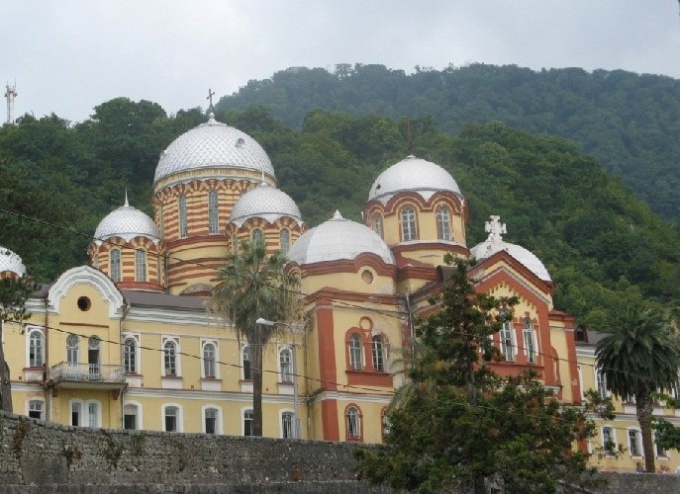 In New Athos, located 21 km from Sukhum, before reaching it, and can be reached by train "Adler – Sukhumi", which runs every day. Sent it at 7:30 in the morning, in the New Athos arrives at 11:18. From Moscow to Sukhum goes 305С special train "Moscow-Suhum", from the capital to arrive in Abkhazia on him, but in the winter, the train departs 1 every 4 days, and in the summer runs every day. In the composition 075С fast train "Moscow-Adler" there are several trailer cars, which also can be purchased non-stop tickets to Sukhum. Buying a ticket at any railway ticket office on the train, then specify the target station is Fun. It is located on the border with Abkhazia and on it you can not go to pay for the ticket and pass the border control is possible directly in the car. If you go to New Athos in his car, after Sochi and Adler follow up to Fun, where a new border checkpoint. The driver and passengers through the customs separately – the driver passes it along with the car. Passengers must go, taking with him only a Russian passport and birth certificate of children. An inspection is usually limited to 10-15 minutes at the border if there is no queue. After passing control, get in the car and hit the road for the former Federal highway Sochi-Sukhum, it goes along the sea and you will not get lost, especially since the signs on the highway already installed. Through 85 km from the border you will be able to admire the stunning view of the sparkling in the sun gilded domes new Athos monastery. Time in Abkhazia, Moscow, and the local currency - Russian roubles. In Abkhazia there are no ATMs, so withdraw the required amount of cash in Russia.